The plaza on the west side of the Capitol was teeming with protesters during the rally, which was billed as a chance to “occupy the Capitol.” Outside the building, student leaders and top Democrats who voted to slash higher education budgets last year addressed the crowd. “We’ve cut billions of dollars and I’ve hated every minute of it,” said Senate President Darrell Steinberg (D-Sacramento). California Highway Patrol officers patrolled the area during the rally, and a helicopter circled overhead. 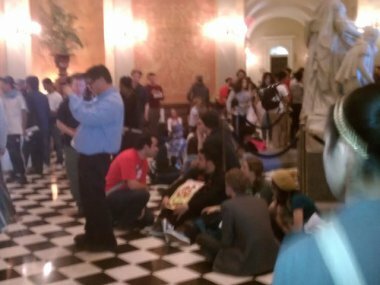 Long lines formed at the Capitol entrances as some Occupy protesters planned to rally in the rotunda and other students sought out lawmakers. Some of the thousands of students protesting at the State Capitol have moved inside and are now occupying the rotunda. About 300 people are inside the rotunda, some sitting on the floor. The California Highway Patrol, which is in charge of security at the Capitol, is blocking any more students from entering the rotunda saying there are already too many people citing fire codes. However, the Capitol is still open and people are starting to lineup in the halls. 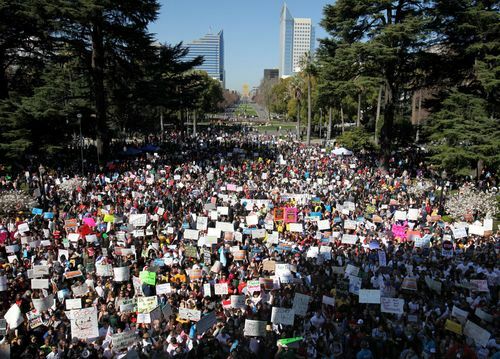 CHP is not commenting on what will happen when the Capitol closes at 6:00 p.m.
Organizers had estimated 10,000 people would participate in the “Fund our Future” march and rally. Law enforcement officers lined up en masse on streets near the Capitol, and a California Highway Patrol helicopter flew overhead as protesters converged at the building. CHP officers detained a couple of protesters for carrying signs that looked like metal shields. Ironically, the two detained students were among the 19 people pepper-sprayed on the campus of UC Davis back in November. The Sacramento Chapter of the Guardian Angels says its members will also be on hand “acting as additional eyes and ears for the Police”. The protesters want the governor and Legislature to raise taxes on the wealthy and use that money on public education. Monday’s capital rally comes four days after college students held rallies, marches, walkouts and teach-ins at about 30 campuses across California. Organizers say the demonstrations were organized to coincide with state budget negotiations. The massive protest comes one week after two officers were hurt in a clash between members of the Occupy movement and a pro-white group at the Capitol. New York and California College Students Gather in Thousands at State Capitols. Thousands of students, union members and Occupy protesters are gathering Monday at the New York and California state capitols, calling for a millionaire’s tax to fund public higher education. The two protests, organized separately but held in solidarity, follow March 1 nationwide demonstrations, in which Occupy College protests called on the universities to stop employee layoffs and hikes in tuition and fees. But Monday’s demonstrations are shifting the action from the campuses to the capitols, calling on legislators and governors to reverse a trend of cutbacks at public universities. California’s public universities lost more than a $1 billion in support from the state in a round of cuts for the 2011-12 budget. Gov. Jerry Brown, a Democrat, announced in December, another $300 million would unexpectedly be cut from higher education because revenues were coming in below projections. Since California’s budget cutting fervor set in back in 2009, public universities in the state have have lost $2 billion and community colleges had $695 million trimmed from their budgets. Students in California have held dozens of demonstrations against tuition hikes and budget cuts, to no avail. Tuition increased from $3,500 in 2001 to more than $13,000 in 2011 at the state’s public universities. 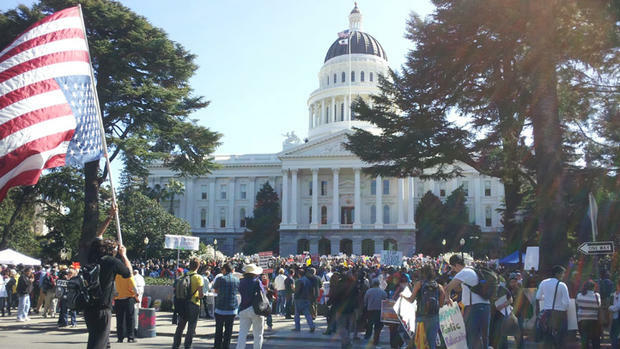 Some students and faculty members have been on a 99-mile march, which began in Oakland on Thursday and was expected to end at the capitol in Sacramento on Monday. Van Jones, a former White House adviser and founder of the Rebuild the Dream coalition, will speak at the California state capitol alongside the student and faculty demonstrators. Last March as New York’s legislature approved $1.3 billion in education cuts, hundreds of protesters protested at the capitol in Albany . On Monday, students are joining the organizing groups New York Students Rising and Occupy Education with a demonstration at the state capitol in Albany. They’re asking the New York legislature to not further cut higher education and to pass a millionaire’s tax to pay for it. Nationwide since 1985, college tuition and fees have increased more than fivefold, according to the U.S. Bureau of Labor Statistics. While student enrollment has grown at public colleges and universities over the past decade, staffing levels have declined. According to the Government Accountability Office, both public and private universities have increasingly relied on tuition for funding as states have dropped support and endowments slowed or shrunk. There have been signals Cuomo and the New York legislature will push for a more progressive state income tax structure. Polling of New Yorkers from October, while Occupy Wall Street protests were in full swing in the financial district of Manhattan, showed voters favored instituting a millionaire’s tax. New York City Council Member Gale Brewer, a Democrat, said if a millionaire’s tax is passed in New York, the Occupy movement could take credit for that. Student protesters in New York and California are counting on momentum from the Occupy movement. Collins in New York is hopeful a millionaire’s tax will provide a solution to financial shortfalls. Don’t forget the students at ucsd who are occupying thsi week! UCB is not increasing enrollment. Birgeneau accepts $50,600 foreign students and displaces qualified instate Californians (When depreciation of Calif. funded assets are included (as they should be), out of state and foreign tuition is more than $100,000 + and does NOT subsidize instate tuition). Instate tuition now more expensive than Harvard, Yale. Like Coaches, Chancellors Who Do Not Measure-Up Must Go. A little research will show similar protests during jb’s first occupancy (not the mansion, the office) in Sacramento. And the same results will unfold from both sides of the so-called dividing line aisle.. Whoever organized to allow any of the hacks and former hacks (green adviser to the White House?) to address the assembly of students must of foreseen a different outcome. The new slogan, “tax the rich” is losing ground to reality, hence the drowning out of one speaker, “show us” from the students indicating no faith it will ever happen. But that’s just all a diversion from the real pentagon busting fight for free education, period. Case in point, the two aircraft carriers in San Diego Bay….your choice? Education or war(s), among a few other things humanity might require. Our teachers, here, just can not, quite, seem to grasp, this ancient equation, despite all the outcomes in bodies and shredded lives over a few centuries. Our students are correct to mobilize and protest. They know now, more than before, the true nature of the enemy. All speeches and urgings from all the hacks are just false hopes attempting to disguise their inevitable answer, No! And, of course, hoping, from their (the 1%) perspective, some blown off steam ie demoralizing the youth. But there is much more on the horizon from our side…..nevertheless the rulers ain’t stupid, the rules about protesting are being changed, now as we write, print, speak, and communicate…they (both parties) think far in advance…….give them credit for that. That’s one challenge before the students, everywhere, and us. Hope the crowd grows, it’s what’s needed. Start re-printing those copies of the ‘The Paris Commune,” they will come in handy. And, if you’re viewing the “signs of the times” from the perspective of non-violent, direct action (as [for the purposes of NDAA and HR 347] I have to state that I am), then pick up a copy of Stephane Hessel’s “Time For Outrage” which is included in the March 7-14 issue of “The Nation” now available on news stands (everywhere?)! Otherwise, if you’re viewing the “signs of the times” from the perspective of the Egyptian Revolution and want to “shut down the flows” (in preparation for the “American Spring”), then you could download a copy of the French Invisible Committee’s training manual – “The Coming Insurrection” – at http://libcom.org/files/thecominsur_booklet%5B1%5D.pdf (diagrams and plans taken from the Egyptian pamphlet “How to [Testify for Your Rights] Intelligently”) ! Sorry, I bought my paperback copy of the book from Amazon a few months ago. The Nation’s translation is in the March 7-14, 2011 issue (available at your local library?). You can also download a copy from iTunes (computer) or for any iOS device (iPhone, iPod Touch, iPad, Apple TV) or as an epub ebook for any Android device.